WindyNation - Ultra-flexible, sae j1127 approved, PURE copper cable manufactured and annealed to ASTM standards. Please see the photo gallery for a detailed specification chart. Rated up to 600 volts, flexible, operating temperature: -58°F to +221°F, solvent repellent, abrasion resistant EPDM insulation. Windynation power-flex welding/battery cable is a premium grade, PURE copper cable manufactured to the highest standards right here in the USA!
. Power-flex cable is ideal for welding applications, battery wiring applications, off-grid wind and solar systems, inverter to battery wiring, RV & car audio/stereo wiring, and any application that requires an ultra-flexible pure copper conductor. Simply use the variation options to 1 select the cable gauge size you want and 2 select the insulation colors and cable length you want. 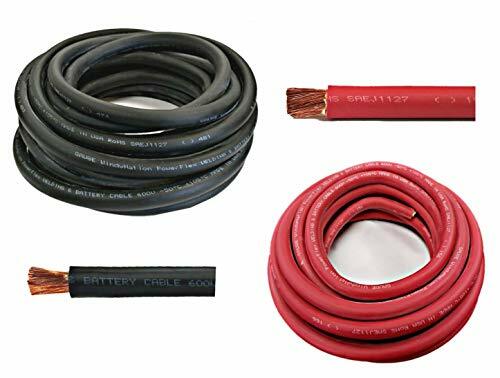 Made In The USA - Car, Inverter, RV, Solar - WNI 4 Gauge 5 Feet Black 5 Feet Red 4 AWG Ultra Flexible Welding Battery Copper Cable Wire - 100% made in the usa cable. Refer to the photo gallery for a detailed specification chart for each gauge size. Available gauge sizes range from 8 gauge to 4/0 gauge. Windynation's power-flex welding and Battery Cable is an ultra-flexible industrial grade cable that is manufactured in the USA to the highest quality standards. SELTERM - Heavy duty battery cable lugs from SELTERM are manufactured using industry leading manufacturing processes to guarantee a high-quality product. Can be Crimped or Soldered. Copper tubing used for producing the battery cable lugs meet ASTM B 188 electrical grade standard. The copper eyelet connectors are rated for up to 600 volts and tested to ANSI/UL 486 standard. Heavy duty construction for Enhanced High Temperature Durability. Furthermore, the copper battery lugs are both UL and CUL listed to ensure optimal performance once installed. Close end pad seals Out Moisture Keeping Cables Dry. Ul tested & Approved. Made from 100% annealed Electrolytic Grade Copper for Max Conductivity. SELTERM 10 Pack 4 Gauge 4 AWG 3/8" Stud UL Heavy Duty Copper Crimp Lugs Welding Cable Bare Copper Eyelet Lug - The copper lugs also meet S. A. E conductivity standards and are RoHS compliant. Lugs are suitable for use with Welding Cables and Battery Cables.